What is Photo GPS Extract? 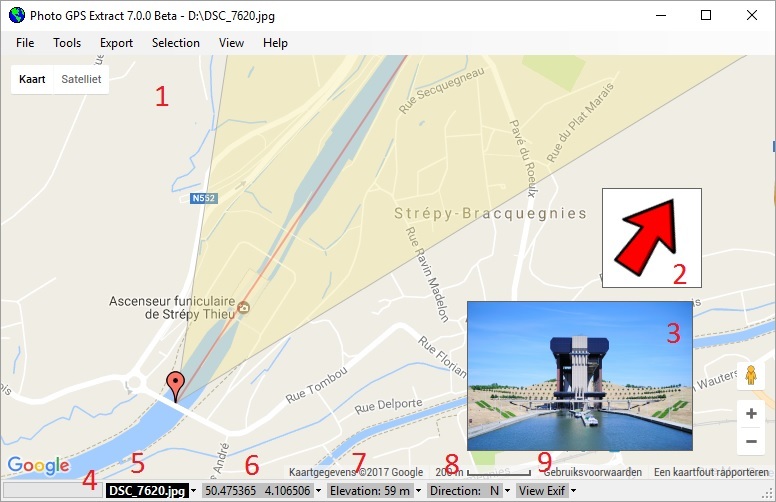 Photo GPS Extract (shortly PGE) is a small utility to visualize the GPS coordinates of a JPG photo on a map. This allows you to determine where a certain picture was taken. More and more modern digital cameras have a built-in GPS module. They record the latitude, longitude and elevation at the time a photo is taken. Don't worry if your camera doesn't come with a GPS receiver: you can add the GPS coordinates yourself afterwards. The GPS information is stored inside the JPG photo. This information is not very useful without a tool to visualize it: this is why I designed Photo GPS Extract. PGE uses the Google Maps to show the coordinates of a photo. This means the application requires an active Internet connection: you can't use PGE offline. How to use Photo GPS Extract? Launch the program and open a photo through the menu File - Load Photo. 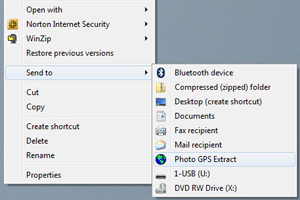 Drag a JPG from your desktop or Windows Explorer, then drop it over PGE's main screen. Right-Click any JPG photo in Windows Explorer. Then click the "Send To" menu and select "Photo GPS Extract". PGE will now be opened and display the location of the photo. 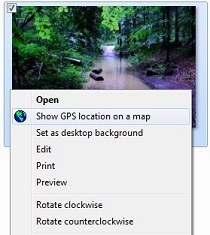 Right-click a JPG photo in Windows Explorer and select "Show GPS Location On A Map". (Please note you need to activate the option 'shell integration' before you can use this feature). An optional direction pointer to indicate the heading of the camera (wind direction).